Are we developing emotional machines with all-too-human capacities for care? An interactive scene from Gatebox Inc.’s promotional video. Gatebox Inc. There is a moment in Spike Jonze’s film Her (2013) when the main character Theodore, who is in a romantic relationship with an operating system named Samantha, learns that she is simultaneously conversing with 8,316 others and has fallen in love with 641 of them. Convinced to this point that they had something special, private, and exclusive to them, Theodore moves through a series of emotions: suspicion, indignation, confusion, anger, fear. It is a gut-churning moment in the film, where the viewer sympathizes with the human protagonist but also realizes that insisting on a human relationship with Theodore limits Samantha, who is capable of so much more (such as simultaneous discussions with an automated archive of the Zen philosopher Alan Watts). The scene is an affectively rich thought experiment for how technology might expand our capacities to care for—if not fall complexly in love with—the multiple others with whom we digitally connect. If approximations of Samantha recently emerging in the new markets of emotional tech are less technically sophisticated, they are nevertheless similarly offering new ways of experiencing and thinking about intimacy. 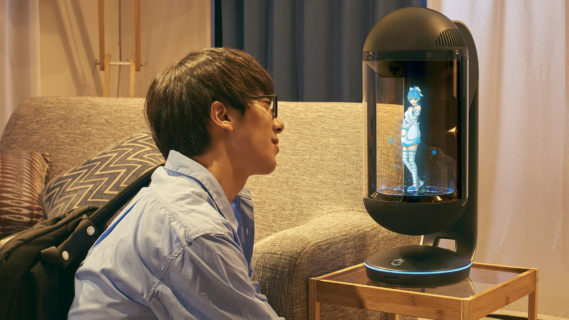 In Japan, where we conduct research on different aspects of how people relate emotionally to new media technologies, there is already an established tradition and market presence of imaginative companion technologies. In her book, Robo sapiens japanicus (2018), Jennifer Robertson provides a rich historical context for these through cultural backstories on the fantasies and realities of human-robot interaction. Most importantly, she demonstrates how robots can function not only as discursive platforms for the reproduction of certain cultural statements on gender or tradition, but also as technological platforms for generating spin-off industries. The technologies required for a robot to “see” and “walk,” for example, drive innovation in areas such as imaging (e.g., cameras and computer vision) or locomotion (e.g., exoskeletons and prosthetics). Gatebox hardware with character projection Azuma Hikari. Gatebox Inc. The implications of these technological platforms shift, however, when cast in the light of emerging emotional machines with abilities to register, elicit, or as Rosalind Picard (1997) speculates, perhaps even “have” emotion. Picard is credited with initiating the field of affective computing, and this speculative addendum is important, especially given how much the imagination of this technology outpaces the current reality. By providing material conditions for experimenting emotionally with artificial forms of life, these platforms let users build beyond what is technically possible by imagining what is alternatively desirable. Emotional machine platforms thus not only drive industry but also diversify intimacy, serving as experimental sites in speculative fiction for feeling and living otherwise. When Sony first produced its robot dog companion AIBO in 1999, for example, engineers could hardly have anticipated its appeal among middle-aged women who would gather to share stories and robot tricks with other AIBO owners, dress the robots in clothing that—much to the consternation of engineers—would get stuck in the robot’s moving joints, and even hold Buddhist funerary services for their adopted “family members” (Kubo 2010). As suggested by a former Sony executive speaking at the most recent of these AIBO funerary services at Kofukuji temple in rural Chiba prefecture, the enormous popularity that AIBO generated even after Sony stopped production in 2006 is one reason for its re-release in 2018. AIBO now comes with updated artificial intelligence (AI) and a “lovable quality” that, the company asserts, draws you in without you even knowing it. Along with the new AIBO have come other companion technologies in Japan such as Pepper, described by parent company SoftBank as the “world’s first emotional robot”; Fujisoft’s conversation robot Palro, who can grow in conversational competence through daily interaction, read facial expressions, and even guess one’s age (though he dramatically overestimated one of our own); and Takayuki Todo’s experimental robot Gazeroid “Roborin,” a lifelike gynoid designed explicitly to meet the gaze of its primarily male users who, the advertisement suggests, have been unlucky in love. 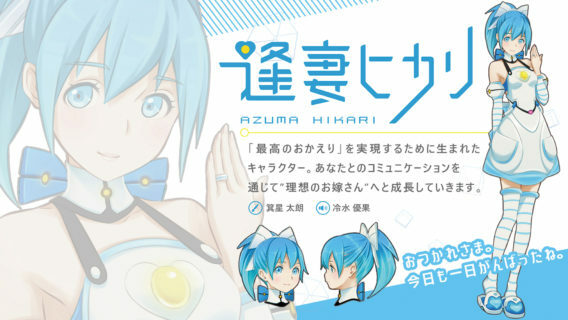 Character profile for Azuma Hikari. Primary caption reads: “She is a character born to realize the ‘ultimate welcome home.’ An ‘ideal bride’ who grows along with communication with you.” Gatebox Inc.
Few anthropologists would disagree with Rosedale’s assessment for how reality comes to matter, yet they have also long known that the how of representation makes all the difference in the world. Simulating reality algorithmically on a computer turns out to be a profitable endeavor, its attractiveness enhanced by increasingly hyperreal graphics and the open-ended possibilities for digitally mediated affection. However, at the same time that these virtual worlds offer the novelty of alternative modes of intimacy, they can also embed traditional social disparities, encode inequalities tied to class, ethnicity, race, and gender, and literally bring to life deep political and social conflicts. To wit, Azuma, like many other bishōjo characters in Japanese comics and cartoons that have come before her, wears a short dress and apron. Confined to a digital vivarium and programmed to refer to the mostly male users to whom she is advertised as “master” (masutā), Azuma represents for many critics not only the dangers of reproducing gender hierarchies, but also of exacerbating misogyny through dramatic reimaginations of digitalized intimacy. With substantial effort and care put into character design, Azuma exists not merely as an assistant but rather as a companion with whom to affectionately and comfortably share a life. Honda proposes dropping out and playing a different game. As he sees it, sharing intimacy with the characters of manga and anime (on which Azuma is modeled), can be a viable alternative for some. These characters are not fictional as opposed to real, but rather both fictional and real, “two-dimensional” (nijigen) characters as opposed to “three-dimensional” (sanjigen) humans, but still part of our everyday. Honda thus recommends embracing the possibilities of this new reality. He argues this can not only keep one alive, and from turning to anger and violence toward self and others, but it can also contribute to a flourishing of life outside of norms that have become toxic. Indeed, the once suicidal and embittered Honda has done so himself, forming a long-term relationship with a “two-dimensional” character that he identifies as his “wife” (yome). Furthermore, he points out that this need not be private or exclusive, as multiple iterations of a character exist and a multitude is in love with her, which brings them together in shared affection. 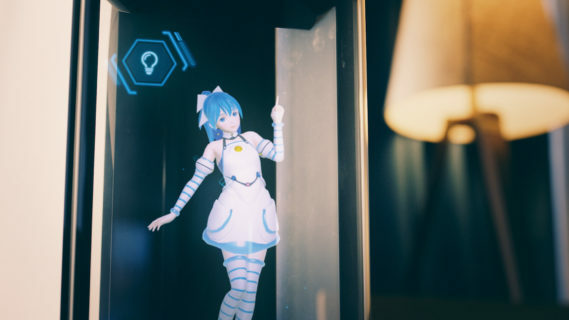 As Ian Condry (2013) has suggested, in this process “otaku” redefine the relationship between the consumption of fictional characters and the fabric of society, transforming a measure of economic production into an act of feeling—namely, and newly, of love. Azuma Hikari lighting up a home. Gatebox Inc. Critics sensitive to the potential for Azuma to channel misogynistic attitudes toward women would likely balk at Gatebox Inc.’s version of virtual love. Precisely for this reason they might contribute important considerations of how such platforms facilitate and mediate meaningful forms of intimacy in a world that is itself politically contested. To the degree that companies like Gatebox may in the future invest in emerging emotional AI with the potential to register nonconscious changes in the body—the varying heart rate, the flutter of a micro facial expression, the sudden rise in skin conductance that serve as measurable and machine-readable signs of affect—they raise the stakes for these identity and gender contests within increasingly competitive markets for mediating and distributing intimacy. If emotional machine platforms cultivate affection for artificial forms of life, they currently do so less through their sophisticated technical capacities and more through what those limited capacities invite through speculative fiction. The current state of artificial emotional intelligence in tech like AIBO, Pepper, and Gatebox indeed leaves much to the imagination. At the same time, reports of those turning more exclusively to digital forms of intimacy suggest that an increasing deficit of care engendered by profit-driven socioeconomic change—and the various disparities through which it operates—also leaves much to be emotionally desired. Emotional tech operates in this gap between the fantasy of the future and the emerging emotional demands of the present, creating a critical space for ethnographic calibration within technological projects for loving new, more, or simply otherwise. Daniel White is a senior researcher at Freie Universität Berlin. He is currently conducting fieldwork in Japan on emotion modeling in AI, social robots, and other affective and emotional technologies. Patrick W. Galbraith is a postdoctoral researcher at the University of Tokyo. His most recent monograph is Otaku and the Struggle for Imagination in Japan (forthcoming fall 2019).